ACRE Hallmark is a quality standard scheme for the management of community buildings/village halls and has been in operation in Northumberland since 2008, managed by Louise Currie. To gain the Hallmark standard each hall is assessed by two 'visitor' volunteers/committee members of other halls in Northumberland. 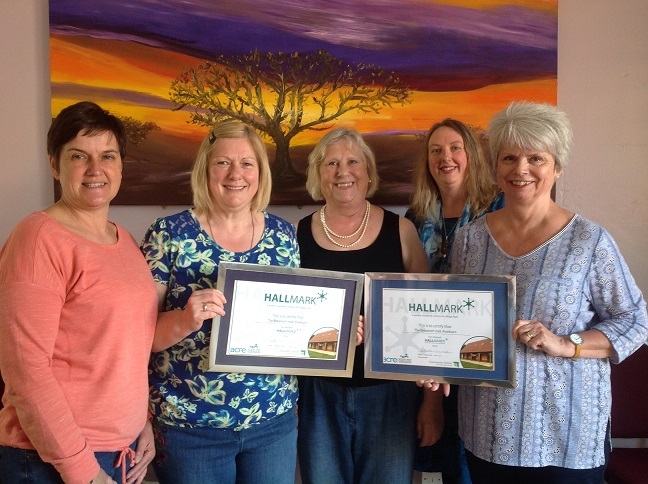 They have undertaken training as assessors in Hallmark. Several halls in the county have achieved Hallmark 1 and 2. More details of the criteria and application process for Hallmark level 1 are available in the Hallmark 1 Checklist and Hallmark 1 Entry Form. Please contact Louise Currie to discuss your application in more detail before submitting your entry form. Louise would also be interested to hear from any experienced community building trustees who would be interested in volunteering as a Hallmark assessor. Doreen, Secretary of Breamish Hall has shared her experience of working towards Hallmark status. "When I joined the committee of The Breamish Hall, Powburn, one of the first things the Chairperson, Mrs May Wilson, said to me was that she wanted to achieve Hallmark for our hall. Having just moved from the town to the country I had no idea what she was talking about! 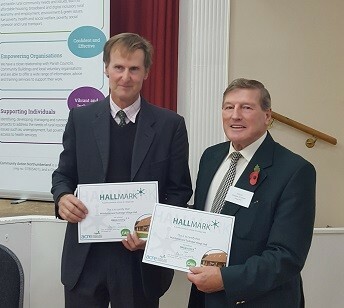 After settling in I started to look into Hallmark and discovered it was a series of 3 awards to show how the hall is administered, how we deal with health and safety, security and licences and how we deal with Community/Social Awareness forward planning and development. It was with some trepidation that we approached the first award as none of the committee had any experience of trying to achieve an award. A sub-committee was set up. The 39 criteria provided by Community Action Northumberland and advice on where to find evidence was really useful. On first reading the criteria we were pleasantly surprised that we were doing most of the things we should be however on looking at the evidence required we soon realised that not everything we were doing was being recorded or there was no proof available that we were doing things correctly. This led us to examine our actions much more closely. For me and a few of the newer committee members, it gave us a much clearer insight as to why things had to be done and how they should be recorded and how often. Hallmark became a Standing Agenda item at our meetings as the committee debated several of the criteria and produced policies to back up our procedures. It was with great delight that we achieved Hallmark 1 on 28/1/15. We were able to reduce our insurance costs by 5% at the next renewal. When applying for grants and funding we are able to say we had achieved this quality standard giving funders confidence we are administering and managing the hall competently. Encouraged by our success with the first award we decided to apply for Hallmark 2. This was a much more exacting task with 59 criteria. Whilst we were carrying out the majority of the criteria, there were some things we had not even considered such as inventories for the hall as well as from groups storing equipment in the hall. Again a lot of discussion took place at committee and different members took on different tasks/responsibilities to enable us to proudly achieve Hallmark 2 on 14/3/2016. We are now confident we are carrying out our health and safety procedures correctly. After taking a year out to renew our hall floors and decorate etc. we have now started the process again with Hallmark 3. Again there are 58 criteria to meet. We have, so far, devised an action plan to ensure we are complying with the criteria, with different committee members assigned to different tasks. It may take us a while but we are determined to achieve this award! We have worked hard on these awards and gained in confidence as a committee at each stage of the awards process, we now have a far better understanding of our policies and procedures which has led to The Breamish Hall being managed in a much more efficient way. It has also greatly reduced the risk of being hit by the “unexpected” as we are a much more proactive and forward thinking committee now. I would urge any Hall to have a go as you learn so much in the process and Community Action Northumberland are always on hand to help."